Is Your New Year’s Resolution “Wellness” …Again? One of the most popular New Year’s resolutions is “I want to get in better shape in 2017.” If this is your resolution, Aliat wants to help you succeed. A wellness resolution is not meant to be temporary. Temporary mindsets only result in temporary change. What you need is transformation! This takes self-awareness, consistent routines and healthy habits that lead to true lifestyle change (so you don’t end up having the same resolution the next year). This is your year! Behind the scenes in the Aliat office, our staff has been training at Orangetheory Fitness for the last few months. We’ve had such a great experience that we have to share! 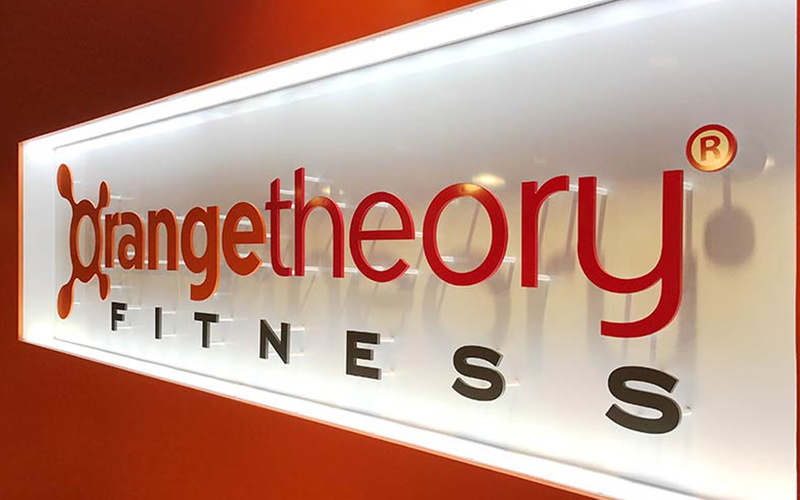 Orangetheory Fitness is a gym that combines the science of your heart rate with the promising results of a cardio/strength workout. The goal is to stay in the Orange Zone (84-91% of your max heart rate) for 12-20 minutes of this 60-minute workout. On Christmas Eve, our CEO Bob Kohnle hit his personal best with 32 minutes in the Orange Zone and 917 calories burned! 1. Set Obtainable Goals: One of the first questions you’ll be asked by the staff at Orangetheory Fitness is, “What are your wellness goals?” Monthly check-ins with trainers help you reach your original goals, and set new ones along the way. If long-term goals aren’t your thing, focus on each individual class. Leave the gym with 12-20 splat points and rest up knowing you gave it your all. 2. 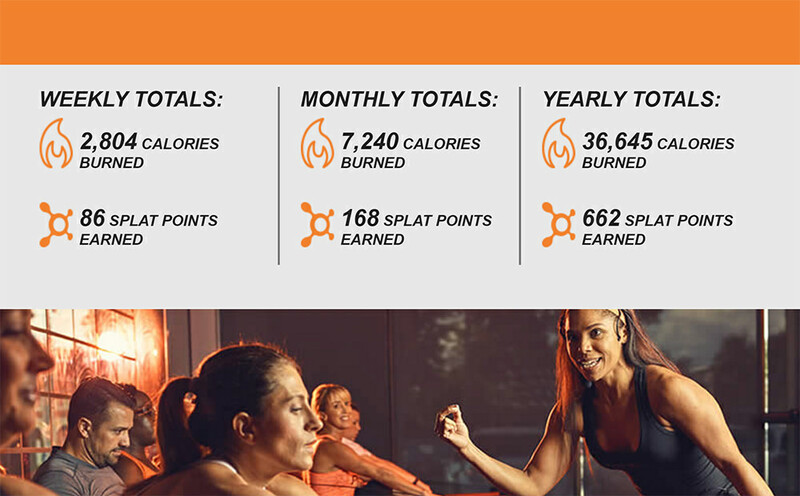 Have Accountability: Orangetheory Fitness takes ‘gym buddy’ to a whole new level. The trainers know you by name and everyone is there to work. The atmosphere is awesome! Not to mention a ton of high-fives, Facebook group encouragement, out-of-gym events and a sense of community. Orangetheory Fitness keeps you motivated through the months. Since our staff joined Orangetheory Fitness, the gym has kept us active with challenges every month. It all started with October’s Hell Week – eight days of intense exercise leading up to Halloween. The challenges continued into November. 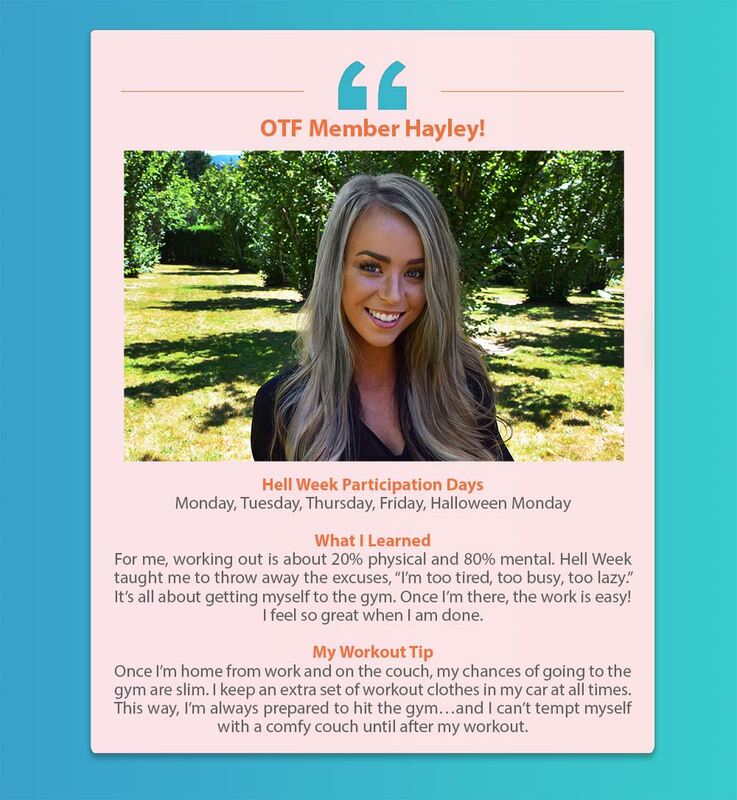 At the Portland-Lloyd District location, OTF members who completed 12 workouts in the month of November were entered to win a free Spa Giveaway. The Tigard, OR location completed a similar December challenge they called The 12 Days of Fitness. 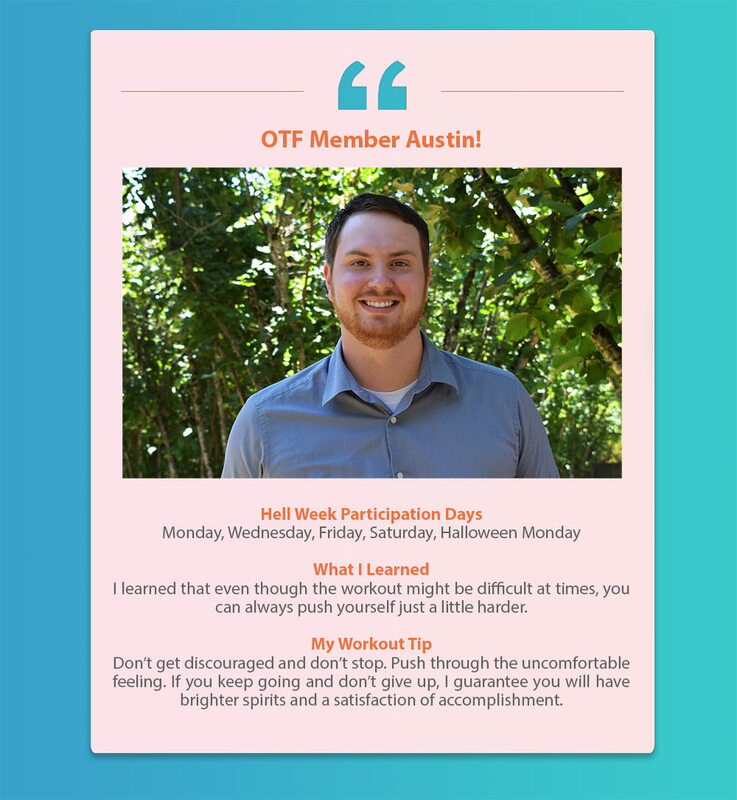 Monthly challenges are a great motivator because the end goal is obtainable and feels within reach. 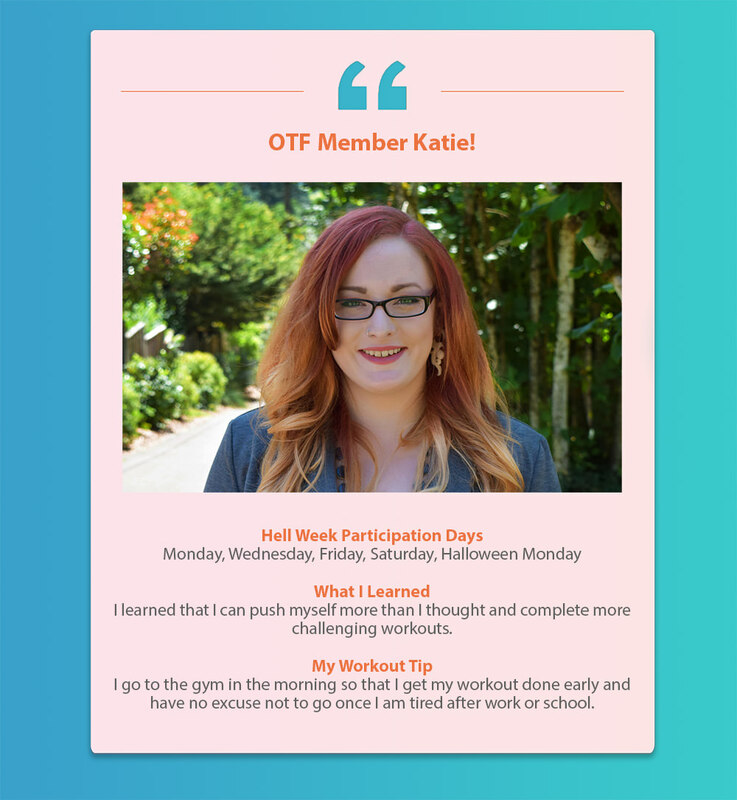 To give you some insight into a month-in-the-life of an OTF member, we’re highlighting our favorite monthly challenge thus far: October’s Hell Week. We hope this encourages you to check out your local Orangetheory Fitness for a free first class! What motivates you to run faster? Lift heavier? Wake up earlier? Go to the gym even on your off days? For the members at Orangetheory Fitness…the answer is Hell Week…and a cool free t-shirt. The “holiday eating season” as we like to call it begins on October 31st – the day candy is justifiable, and therefore an acceptable food group. Orangetheory Fitness counters all of this candy eating with nationwide challenge deemed (or doomed) Hell Week. Every year, Hell Week runs for 8 days in a row leading up to Halloween. The Challenge: complete at least five 60-minute high-intensity workouts in eight days. 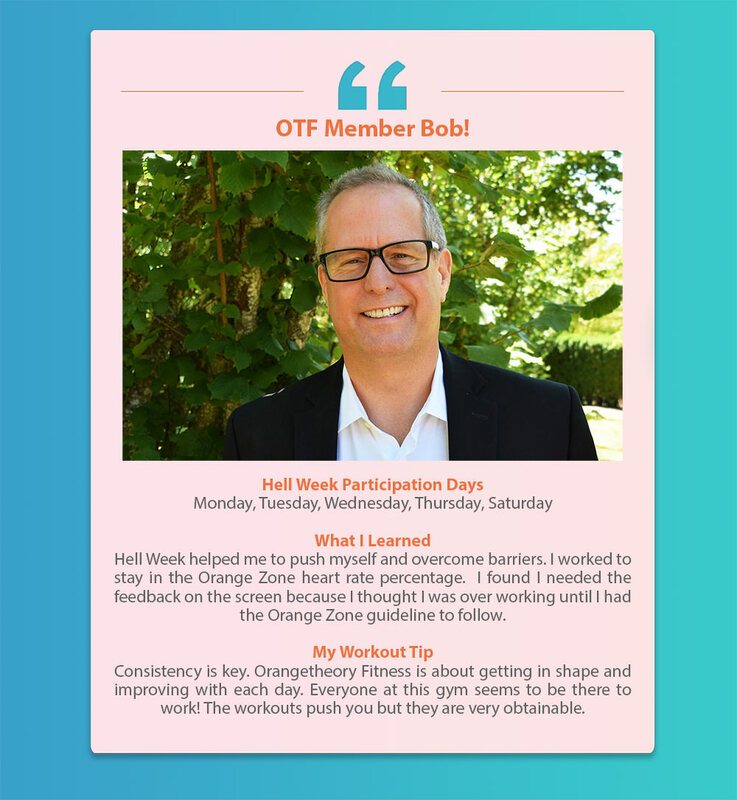 The Reward: A free Hell Week t-shirt, bragging rights, and a healthier body! That might not seem so challenging for the gym junkie, but there’s one catch we have yet to mention…. These workouts aren’t your average OTF workouts. These are harder intervals, higher hill climbs, heavier weights, more reps and less breaks. They call it “Hell Week” for a reason! A few of us at Aliat completed the challenge successfully. Below, we share what we learned…plus, our own personal workout tips.